It’s so exciting for me to share with you an easy pie crust recipe that doesn’t sacrifice taste or flakiness for ease! And, because I learn by watching, I show you in the video how I roll and shape my pie crust. Plus, there is a free illustrated printable showing the steps too! I normally bake more pies during the holiday season than any other time of the year. So I want them to be amazing. After all, they are for the holiday celebration! This Easy Pie Crust recipe is always amazing! It has not failed me yet – seriously, it is delicious! So, let’s talk about pie crusts for a bit and then you can watch the video so I can show you exactly how I shape my pie crust and give tips for the best crust ever. Do you get nervous when it comes to making a pie crust? Well, calm those fears, there is no need to scared. Let’s do this together! Pie crusts are like different personalities. They can be crisp, flaky, tender… and a combination of several qualities. It all depends on the ingredients. Butter creates the main flavor of a pie crust. The flake comes from the vegetable shortening. Put the two together and you have a flaky, tender and tasty pie crust. A crust that made using only butter is delicious and crisp but will not have much flake. While not necessarily what we are looking for in a pie crust, it does have a purpose. An all butter dough holds its own against juicy fillings and can be rolled out for use in a free form pastry. Crusts with all shortening are full of the flake but do not have a lot of flavor. This is not an option for most bakers looking for the best of both – an easy pie crust with flavor and flake! This Easy Pie Crust recipe is just that – the perfect mix of ingredients to produce the delicious flavor and flake most people want in a pie crust. It can be used for any pie, sweet or savory, fancy or plain. I like to mix it by hand but you can also use the food processor or mixer. The dough for the Easy Pie Crust recipe can be doubled to make 4 pie crusts and it will keep in the refrigerator a week. I have also frozen it for about a month and then thawed it in the fridge before using. Watch the video to see how I make my pie crust. I like it to look pretty when it is finished, personally. 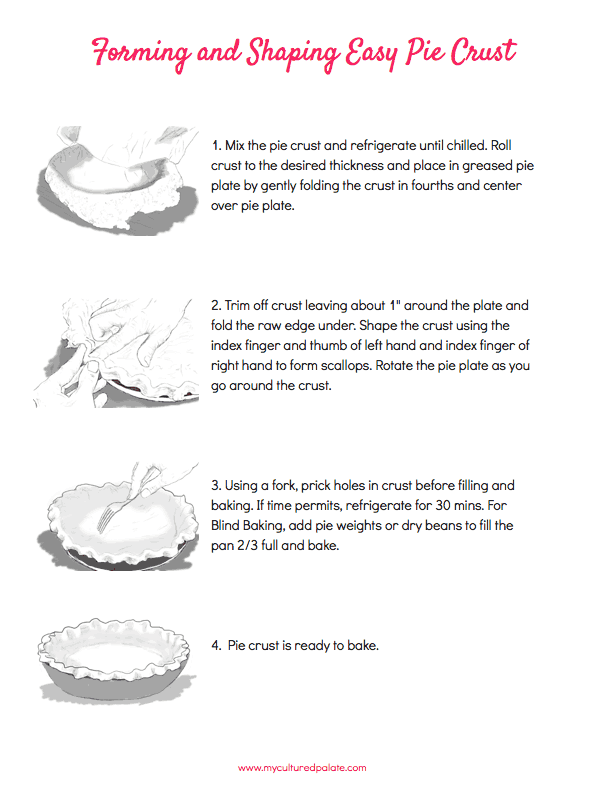 Below the video is a free illustrated printable that shows the steps to rolling and shaping the pie crust. I love seeing what other people use and why they like the products. Here are the items you see me use in the video. The links take you to the items that I have purchased. Rolling pin – I love this marble rolling pin because it is just the right weight and the marble stays cool and doesn’t warm the dough. Measuring cups – I personally like the glass measuring cups and use the 2 cup and 4 cup ones. Flour canister – I bought most of my Polish Pottery while we lived in Switzerland. When I am looking for something new, I keep a check on eBay. Here is a free illustrated printable that shows the steps I take in the video. 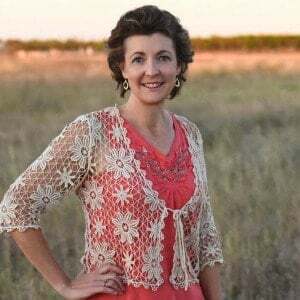 You can click on the image of the printable or there is also a download link at the bottom of the post – both will take you to the pdf for printing. 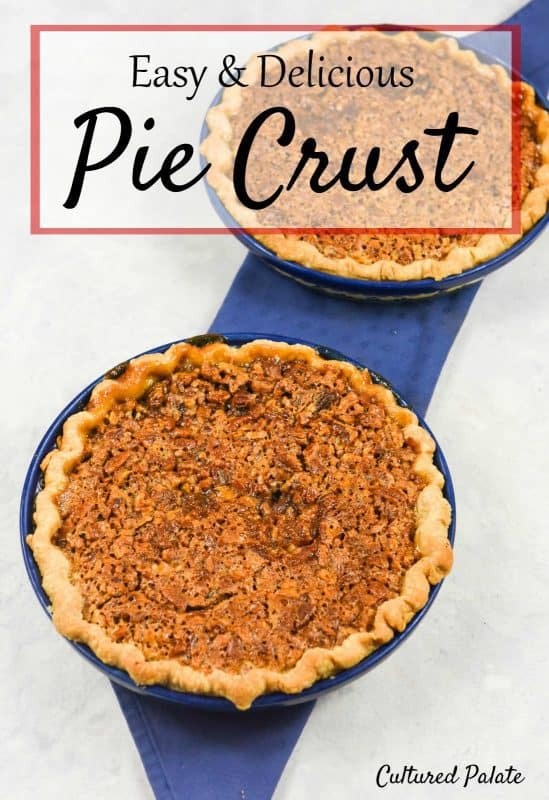 If you’ve tried this easy pie crust recipe or any other recipe on Cultured Palate please take a minute to rate the recipe and leave a comment letting me know how you liked it. I love hearing from you! You can also FOLLOW ME on PINTEREST, FACEBOOK, INSTAGRAM, YouTube and TWITTER. There is nothing that says homemade like a delicious flaky crust and this one is both. Plus, it is easy peasy and works every time! Using a pastry cutter or your fingers, add the butter and mix until it is coarse crumbs. Add the shortening and mix until you have small clumps. Gently, add the ice water. Turn out onto your counter and fold it together several times. Work gently - the dough will be soft. Refrigerate for at least 30 minutes - you want to chill the dough completely. Divide dough in half and gently roll it out to a circle. Fit in pie plate, form edges and prick the bottom with a fork. If time permits, chill the crust for 30 minutes. Fill and bake according to instructions. Roll the dough on a flour dusted smooth surface. Be careful not to stretch the dough as you put it into the pie plate handle it gently. Julia Child said that what you stretch now will shrink later! If time permits refrigerating the crust after shaping allows the gluten to relax - 30 minutes is enough time for this. Then bake as directed. For Blind Baking add pie weights or dry beans to fill the pan 2/3 full and bake. This is genius and so helpful! Maybe this year I will finally mast pie crust with your tips! Melissa, I have confidence that you can and will! I love your list of tips! Especially using ice water! It’s the only way to go. Thanks, Linda, so glad you liked them! Shelby, I look forward to hearing how it comes out! Love that you made a video for making this easy pie crust! It looks so perfect! Thanks for sharing your tips too! Jessica, you are welcome and I hope it helped. Sometimes, it does help seeing someone do it! I wish i had know about this recipe during the holidays. I’m excited to give it a try. I love the video and the actual written instructions provided. Excellent work! Thanks, Tina, so glad it encourages you! I absolutely love your video and pdf, thanks so much for sharing this!